How old am I? So old that I remember when "tin cans" actually had tin in them. So old that I watched Rin Tin Tin when it first came on TV. Tin is a chemical element with symbol Sn (from Latin Latin: stannum) and atomic number 50. It is a post-transition metal in group 14 of the periodic table. It is obtained chiefly from the mineral cassiterite, which contains tin dioxide, SnO2. Tin shows a chemical similarity to both of its neighbors in group 14, germanium and lead, and has two main oxidation states, +2 and the slightly more stable +4. 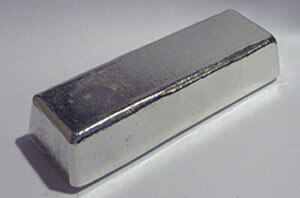 Tin is the 49th most abundant element and has, with 10 stable isotopes, the largest number of stable isotopes in the periodic table, thanks to its magic number of protons. It has two main allotropes: at room temperature, the stable allotrope is β-tin, a silvery-white, malleable metal, but at low temperatures it transforms into the less dense grey α-tin, which has the diamond cubic structure. Metallic tin is not easily oxidized in air. The first alloy used on a large scale was bronze, made of tin and copper, from as early as 3000 BC. After 600 BC, pure metallic tin was produced. Pewter, which is an alloy of 85–90% tin with the remainder commonly consisting of copper, antimony, and lead, was used for flatware from the Bronze Age until the 20th century. In modern times, tin is used in many alloys, most notably tin/lead soft solders, which are typically 60% or more tin. Another large application for tin is corrosion-resistant tin plating of steel. Inorganic tin compounds are rather non-toxic. Because of its low toxicity, tin-plated metal was used for food packaging as tin cans, which are actually made mostly of steel or aluminum. However, overexposure to tin may cause problems with metabolizing essential trace elements such as copper and zinc, and some organotin compounds can be almost as toxic as cyanide. Tinning is the basic process of coating another metal with a layer of tin. Think galvanizing except using tin instead of zinc. Normally you find the inside of copper pots coated with tin. This is to stop the reaction of certain foods with copper. I first saw tinning demonstrated at John C Campbell Folk School in the Festival Forging class taught by Pat McCarty. He demonstrated forging a ladle out of copper and then taking a stick of tin, rubbed it around the heated copper bowl of the ladle (tin melts at around 450°F). Then while the ladle is still hot wipe it smooth with a clean rag being careful not to have the rag burst into flames while you're holding it.